SEYYIDE is available to perform Oriental Dance (belly dance) for a variety of events: Family Celebrations such as Weddings, Birthdays and Anniversaries, Bridal Showers, tasteful Bachelorette Parties, Fundraisers, Multi-Cultural Events, Theme parties. She is also available for bookings at Arabic clubs, Middle eastern show-restaurants. "You did a beautiful taqsim last night. You turned that rich, haunting sound into passionate, heartfelt motion!" "Seyyide is one fantastic dancer! Her style, technique, stage presence, composure, and allure are simply astounding. I saw her recently at the Red Fez in Boston and plan to go see her again at the same place later this month (Saturday, June 23). Go, Seyyide!" "Seyyide's magic lies in her experience with varied dance forms, as well as her gift to express the intangible world through physical means." "Seyyide is the best. We had a wonderful time learning to belly dance at a bachelorette party! So much fun!" "Seyyide is energetic, stylish, and a lot of fun!" - A solo performance, involving a single appearance of any length between 10 and 25 min, with one costume. This is suitable for weddings, birthday parties, anniversaries, corporate events, fundraisers. - A solo performance plus class, which includes a single appearance of any length between 10 and 20 minutes with one costume followed by an engaging 45-minute class at beginner's level where all guests are welcome to participate. This is appropriate for baby showers, tasteful bachelorette parties, girls night. 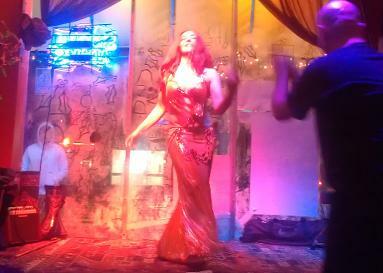 SEYYIDE's performance usually include saiidi cane dance, dancing with veils and/or Isis wings. We can provide recorded music while you provide the sound system. Seyyide adores to dance to live music, let us know if you will have a live band playing or if you want help hiring musicians for your event. Please, send us a message or call 7744-SEY-SUL (774-473-9785) to set a time to discuss tailoring a performance package to suit your needs. Kindly include your name, e-mail, phone number, some good times to reach you and make sure to include the time and location of your event. Performance fees are set on a per-appearance basis, and depend on a variety of factors - the type of performance, the location of the event, the kind of performance required, whether a costume change is requested, whether back-up dancers are requested, etc. We are based in the Greater Boston area. We usually take an advanced deposit to close the deal and save the date, which can be paid online by Paypal. This deposit is refundable up until two weeks before the event, at which point it is non-refundable. In the remote case that we needed to cancel (only in the event of extreme illness or family emergency) this deposit will be fully refunded to you. The remainder of the fee may be paid in advance by Paypal, otherwise must be paid at the time of the performance with cash (or corporate checks in the case of professional events). Sorry, no personal checks accepted on the performance date. Please, fill all fields to receive an answer. I don't have your contact information unless you enter it in the fields above. Thank you!